The Japanese tea ceremony is a centuries old cultural activity where powdered matcha green tea is prepared, presented and enjoyed in a ceremonial manner. It’s known by many other names such the way of tea, chanoyu, sado and chado. The tea ceremony is a lengthy procedure full of very specific rules and procedures which can be confusing for beginners. Here we will help uncover the protocols and learn more about the equipment used, types of ceremonies, the correct etiquette for guests to follow and lots more. 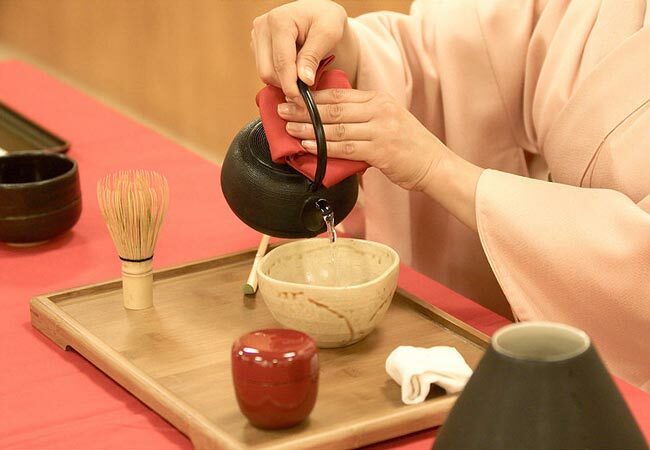 This video shows and demonstrates how the traditional Japanese tea ceremony takes place. Video is owned and created by Moving Japan . As you will see below there are a number of different types of ceremonies. The type depends on a number of factors such as the season, occasion and even the time of day. Chaji: The chaji tea ceremony is the most formal ceremony one can attend. It lasts 4 hours in duration but don’t worry because you won’t be spending all that time drinking tea because it includes strolls through some of the most scenic Japanese gardens, a full course kaiseki meal followed by a serving of delicious Japanese sweets and then ending with tea. Chakai: A chakai is the main informal Japanese tea ceremony. The event does not last long and includes a serving of traditional Japanese sweets and thin matcha tea known as usucha. And although the event is considered to be informal there are still a rigid set of rules that are followed. Any number of guests may join but only three who are known as the shokyaku, jikyaku and teishi will be seated and served a bowl of matcha green tea. The rest of the guests will stand along the walls and be served their bowls only after the shokyaku has been served. Akatsuki-no-chaji: The Akatsuki-no-chaji or dawn tea ceremony is held just before sunrise on cold winter mornings. Drinking matcha by candlelight just as the first sun rays begin to enter the room is a magical experience. Yobanashi: The Yobanashi is a winter evening tea ceremony and if you ever get the opportunity to attend one as a guest I would highly recommend it. This ceremony is held to honor the long winter night and involves enjoying tea in a beautiful candle lit chashitsu (tea house). Usually the tea garden outside will also be beautifully decorated and adorned with candles and lanterns which helps create a surreal environment. Yuuzari-no-chaji: The Yuuzari-no-chaji ceremony is the exact opposite of the previously mentioned Akatsuki-no-chaji. It takes place at the start of nightfall on a summer evening as opposed to the dawn of winter morning, where you will enjoy your matcha by candlelight. 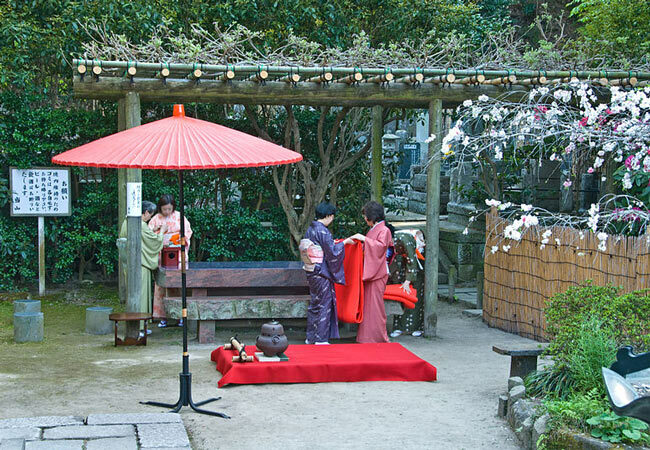 Asa-cha: The Asa-cha or early summer morning tea ceremony is popular during the summers. Temperatures and humidity in Japan during the summer months can really get intense which makes it harder to culturally prepare or even enjoy a warm cup of matcha. Early mornings are still relatively cool which makes it the ideal time. Shoburo: In the winter months a fire pit known as a ro is used for boiling water. However, during summer people switch over to the portable brazier known as a furo. This furo is used starting from May which is why in May shoburo tea ceremonies are held to honor its first use of the year. Hatsugama: Hatsugama translates to the boiling of the first kettle and its a formal ceremony that is very special. The steps carried out during the hatsugama are too long and complicated to explain but it basically involves the teacher conducting the entire ceremony and preparing food for his or her students. The event marks the first ceremony of the year and its importance is clearly evident in the use of the finest food and tea ceremony utensils. Also, the host and students wear their best kimono’s on the day. Kuchikiri-no-chaji: The term kuchikiri-no-chaji translates to tea ceremony honoring the breaking of the seal on a jar of new tea and is considered to be the most formal Japanese tea ceremony of the year. On the 7th and 8th November the new tea season begins and that is when the seals of the jars holding the fresh tea which was harvested in Spring is broken. And with new tea usually comes renovations as many chashitsu tea rooms celebrate this occasion by replacing the paper on their sliding doors, getting new tatami mats and doing whatever other repair work needs to be done. Nagori-no-chaji: The Nagori-no-chaji ceremony is held in October to honor the last remains of the year’s tea supply. This particular event is held just before the start of winter and is deeply symbolic because the tea from the current jar (the jar opened from the kuchikiri ceremony) is almost finished just as the current season. To list each and every tea ceremony utensil along with their countless varieties is beyond the scope of this article. One could actually write a book spanning hundreds of pages on this topic alone and many such books have been written. 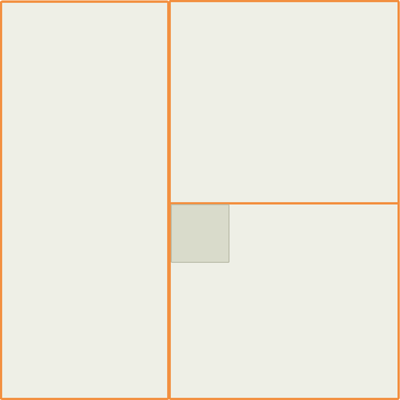 However, here we will only list the most basic such items to give you an idea. A number of cloths are used during a typical Japanese tea ceremony setting with each serving a different purpose. Getting to grips with each one in terms of their functions and how to correctly fold them can be confusing at first but here we will help clarify. Chakin cloths: The chakin is a linen or sometimes hemp cloth used for cleaning the tea bowl. It’s kept moist and in a folded state while inside the bowl. The typical size of a chakin is 12 inches long and 6 inches wide. Fukin: The fukin is a hemp cloth used for wiping the tea pot (chawan) clean after pouring for a guest. An additional use is to minimize or prevent water spillage when refilling the fresh water jar (Mizusashi). 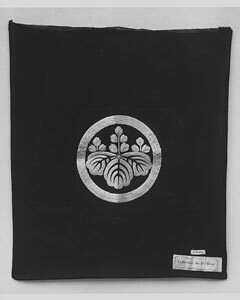 Fukusa cloths: The fukusa is a double layered silk cloth used for cleaning the various other utensils. Just like the chakin, its 12 inches long and 6 inches wide. They can usually be seen tucked into the tea master and his / her assistants obi. Interestingly, it’s customary for men to use purple fukusa’s and women to use orange / red fukusa’s. The following are a list of items used for boiling the water. As you will see below they differ somewhat from the conventional Western electric kettle. 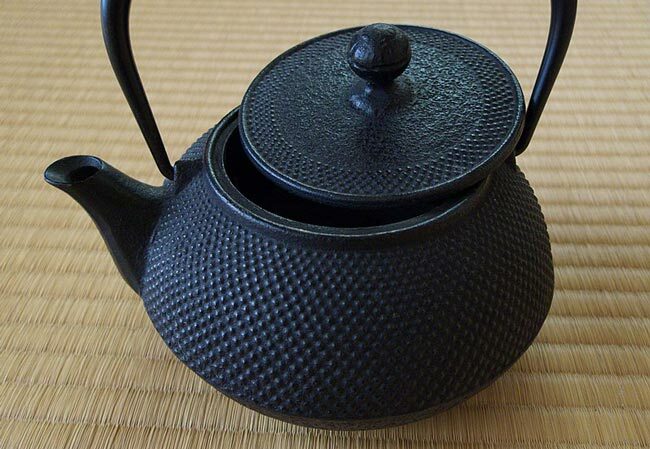 Kettle: The kettle is called a tetsubin and is often a beautifully decorated cast-iron pot. Tetsubin’s vary greatly in size with some of the smallest ones being capable of holding no more than 0.5 litres while the biggest have capacities of up to 5 litres. Hearth: There are two conventional ways for boiling water and the method used depends on the season. During the warmer seasons a portable brazier known as a furo is used. These furo’s can be made from either wood, ceramic or steel. During the colder winter months a fire pit known as a ro is used instead of a furo. Alternatively, if the room in which the Japanese tea ceremony is to take place does not have a built in fire pit, an okiro (portable ro) is used instead. Water containers are essential items in any Japanese tea ceremony set and two different ones are used as you will see below. Mizusashi: The mizusashi is a lidded container that holds fresh water. It serves multiple purposes but its primary function is to replenishing the tetsubin (container which heats the water used in tea). These vessels can be made from either glass, ceramic or wood. Mizutsugi: When water in the mizusashi runs out the mizutsugi (water pourer) is used to replenish it. There are numerous varieties of mizutsugi but we will only cover the two main types – yakan and katakuchi. Yakan mizutsugi’s are made from steel while the katakuchi is of ceramic or wood. Other physical attributes such as the shape, whether or not the vessel has a lid and various other factors can also determine the type of mizutsugi. The Japanese tea ceremony equipment listed within this section involves items having to do with the actual tea itself. Chaki: The word chaki translates to ‘tea implement’ and is the small container that holds the powdered matcha. Choosing a chaki for a ceremony is an art and skill because the container is what guests pay the most attention to, therefore it has to perfectly harmonize with the other equipment. 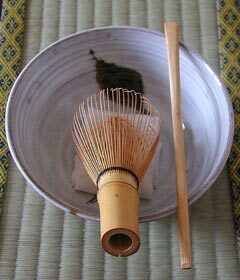 Chashaku: A chashaku is a tea scoop most commonly made from bamboo and 18cm long. It’s not uncommon to find some made from wood and ones imported from China are usually made from ivory. Chasen: The bamboo whisk you see the tea master use to prepare matcha powder is known as a chasen. The varieties of this item is almost endless and depends on factors such as the type, length and thickness of the bamboo and the shape and quantity of tines. Chawan: The chawan is the cup / bowl one uses to drink tea out of. Chawan’s are usually black because the tea is light in color and this helps with aesthetics which plays a big role in the Japanese tea ceremony. You will also notice that these cups are considerably thicker than the Western ones we are accustomed to and this is to help retain heat for longer. There are many styles of chawan which depends on the material, origin and shape. Daisu: A daisu is a portable black shelfing case used for displaying the Japanese tea ceremony equipment. There are various styles of daisu but its purpose, apart from displaying, is to help create a more formal setting. Chabako: Sometimes a tea master will hold a ceremony somewhere other than at his or her own place and would therefore need to travel. This is where the chabako comes in handy because this box stores the needed utensils and allows for easy transportation. Sensu: If you have ever seen a tea ceremony take place you might have noticed the small hand held folding fans tucked into the obi’s of the participants. It’s essential that these fans remain in a closed state at all times even while fanning because their main function is to show respect. When participants in the ceremony are not using their sensu’s for fanning they will place them on the floor directly behind them from where they are sitting. However, while making formal statements to the group the sensu will be placed on the floor directly in front of the speaker. Hishaku: The hishaku is a long water ladle made from bamboo and used for transfering the boiled water from the pot to the cup as well as to fill the pot with fresh water from the mizusashi. Trays: Various styles of trays are used for example the square yohobon tray and the round black-lacquered hakkebon tray among others. The type of food you will be served with depends on the type of ceremony you are attending. There are two main types: Chakai, which is an informal gathering and accompanied with traditional Japanese sweets and the formal chaji ceremony which goes with a full kaiseki meal. Those with a sweet tooth might be glad to know that traditional sweets play a vital role in the informal Japanese tea ceremony. 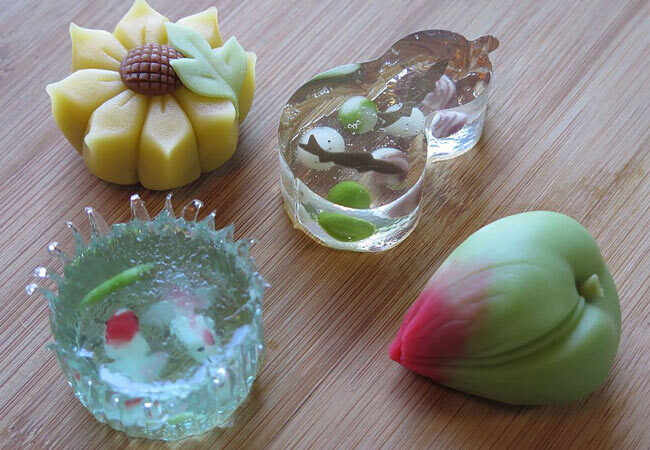 The type of sweets made available will both depend on the season and the style of tea served. Not only do the sweets show generosity from the host but it also prepares your taste buds for the bitterness of the matcha that is to follow. Here we will list some common varieties. Higashi: Higahsi are dry sweets that pair perfectly with usucha (thin green tea). The confectionaries that produce higashi keep the ingredients a secret but its believed that a specific type of sugar known as wasanbon, egg white and food coloring is used. They can take the shape of anything imaginable such as fruits, cherry blossoms and so forth because they are hand pressed with wooden molds. Also, these sweets lack moisture and this results in a very long shelf life. Omogashi: Omagashi are moist sweets which are ideal for consumption before and during drinking koicha (thick green tea). They largely consist of dumplings and sweet buns which are commonly served on heated trays to keep them warm. The formal chaji ceremony, which lasts 4 hours from beginning to end, includes a full kaiseki meal. The meal is known as a cha-kaiseki which guests are served with first, followed by a serving of Japanese sweets as one normally would with the informal chakai ceremony and ending with tea. Included in the full course cha-kaiseki meal is everything a Zen monk would eat because of its low calories. This may include a variety of boiled dishes, rice, soup and even sake. 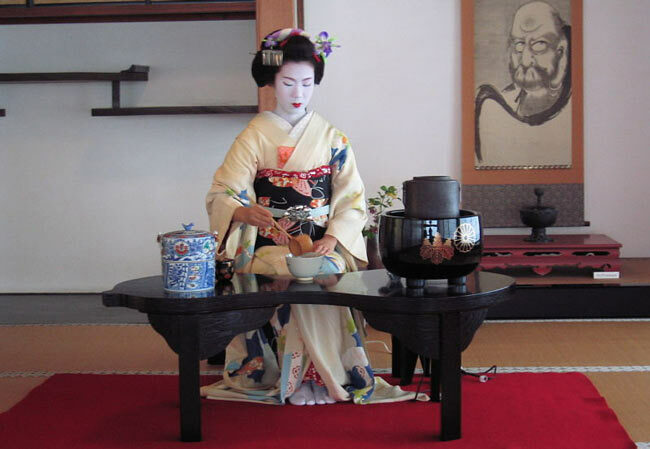 The Japanese tea ceremony can take place both indoors or outdoors. Requirements for each differs so here we will look at these two settings in more detail. 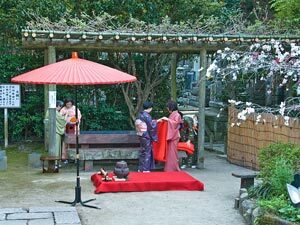 An outdoor Japanese tea ceremony is known in the Japanese language as nodate (outdoor tea preparation). It’s comparable to the Western style picnic and is considered to be a much less formal ceremony. Nodates are ideally suited for the warmer spring to summer months and are ideally held in Japanese tea gardens. A Japanese tea ceremony can take place in just about any room but some rooms have been specifically built for this very purpose. Such rooms are called chashitsu and share certain characteristics which we will explain. One of the first things you will notice when entering a chashitsu are the tatami mats. 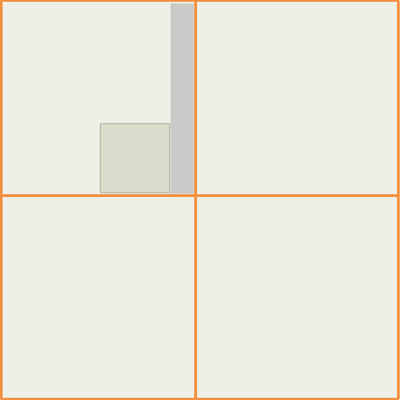 The mat used by the tea master looks identical to the other mats in the room but is referred to as a temaeza. 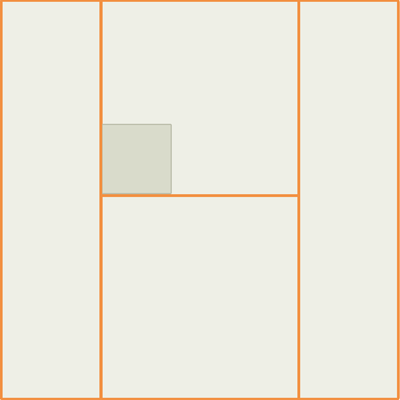 Also, there are various ways tatami mats can be arranged within the chashitsu which determines its style. 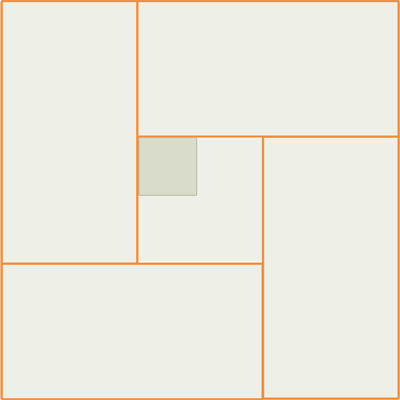 The Yojohan Chashitsu layout has four and a half tatami mats sitting in a sort of spiral formation. 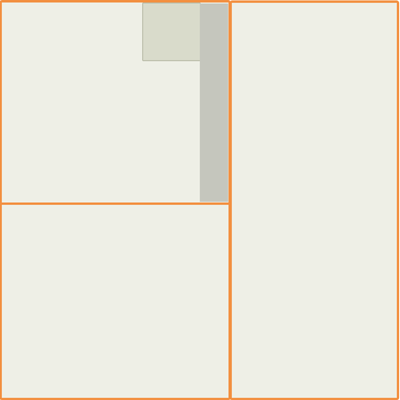 Four mats are layed out along the sides of the room with the temaeza being in the center. The Hira Sanjo Chashitsu is a three mat layout with a fire pit in between the host and guests. The Fuka Sanjo Chashitsu is a three mat layout with a fire pit being in front of the host mat and next to the wall. 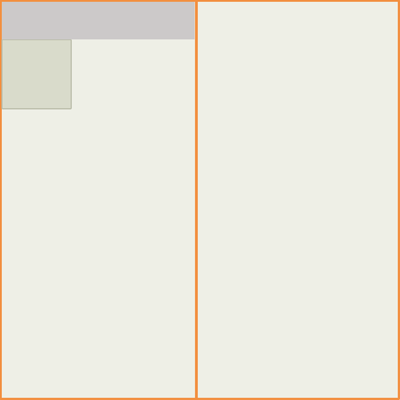 The Old Style Naga-yojo Chashitsu layout is the traditional chashitsu style. It has 4 tatami mats with a fire pit separating the host from the guests. The Nijo Chashitsu layout features two long tatami mats laying side by side. There is also a 3 inch board behind the fire pit and temaeza mat. The Naga-yojo Chashitsu layout has four tatami mats. The host master’s temaeza mat is separated from the guests by the fire pit. The average chashitsu has at least two doors. There is the sadouguchi which translates to ‘host’s entrance‘ and is reserved for the tea master. It’s the normal wood framed paper sliding door which are common in most Japanese homes. A second entry point is the nijiriguchi (small crawl through opening) and is used by guests. The nijiriguchi entry (on average 65cm high and 60cm wide) as can be seen in the photo above may appear strange to a Westerner. To get in one would have to put their hands / head in first and then crawl into the opening on the knees. There are two interesting theories as to why the entry door for guests is so small. Firstly, it forces everyone who goes in to enter in the bowing position which is a sign of respect. Secondly, the small crawl space would prevent samurai’s from entering the chashitsu with their swords and were therefore forced to leave them outside. Every chashitsu has a kakejiku. The word funnily enough translates to hanging thing and is a scroll hanging on the wall. Such scrolls can have either calligraphy, poetry, Zen phrases, letters or even art such as landscapes, birds or flowers displayed on them. The tokonoma is a type of alcove built into the chashitsu where the kakejiku and flowers are displayed. It’s considered to be the most important part of the room and therefore the main guest, known as a shokyaku, is always seated nearest to this part of the room. Powdered matcha green tea is by far the most common tea used in these ceremonies but there is no rule that it has to be powdered matcha or even matcha at all. However, here we will focus on the two varieties of matcha preparation – thin and thick. Usucha is a light variety of matcha and can be easily recognized by its thin surface layer of foam. If you ever order matcha at a Japanese cafe or restaurant you will be served with the usucha variety as will be the case in most instances at traditional Japanese tea ceremonies. 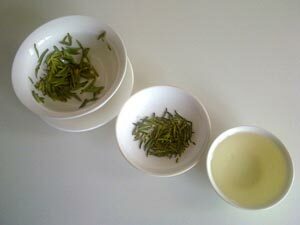 For koicha to get its thickness it has to be made with a double dosage of high grade matcha powder. The thickness is often comparable to porridge and the taste can be a bit too strong for some. Koicha is only served at formal chaji ceremonies. It’s prepared in a bowl that gets passed from one guest to another as each one takes a sip. As each guest has taken a sip the bowl will be wiped clean to purify it. Also, each guest will have to know how to much to sip because the last person is expected to finish whatever matcha remains by the time it reaches him or her. If you are planning on attending a traditional Japanese tea ceremony then the following section will be of particular interest to you. Here we have outlined the do’s and don’ts of attending one of these cultural ceremonies. Naming and seating: When attending a tea ceremony you are likely to be one of a number of guests and not all guests are equal as you will shortly see. The shokyaku, or the principle guest, is a title given to the guest of honor. Not only does the shokyaku get to sit nearest to the tokonoma section of the room but he / she is also expected to do most of the talking with the host. For example, asking questions about the tea ceremony utensils and so forth. It does take a bit of skill because the questions should be timed in such a manner as to not cause problems or interference with the host as he or she conducts the ceremony. The second guest gets the title of jikyaku while the last guest is known as tsume. All other attendees are known as kyaku. How to receive and eat sweets: Japanese sweets are the first thing guests will be served with. What happens is that the host will place these sweets in front of the shokyaku (main guest), do a bow and then tell the guests that the sweets are for them. And as delicious as the look this doesn’t mean you can just tuck in. Instead, the shokyaku will with both hands move the bowl to his or her right. These can only be eaten once the host has warmed the tea bowl (chawan) with warm water. Many people believe that in order to become an actual ceremonial tea master you have to be born into it. This, however is not true. As a matter of fact, anyone can become one. Attending a course which lasts for just under 2 weeks will make you qualified in ‘the way of tea’. 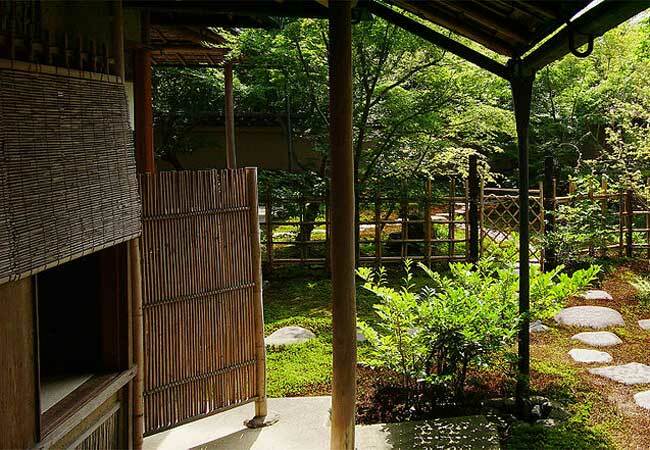 Visit here for a list of the best tea master courses one can take in the beautiful city of Kyoto. 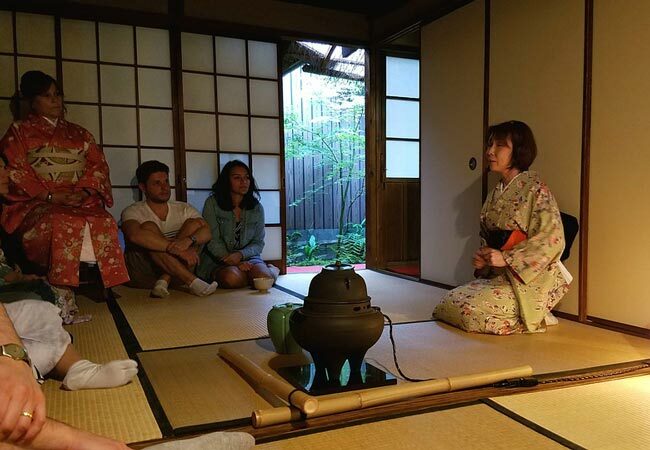 Find out how to attend a real Japanese tea ceremony in the cultural city of Kyoto.. Learn the way of tea with these courses in the beautiful Kyoto City..
Find out which types of green tea are the most popular in Japan.. Learn the fine art of whisking a bowl of matcha the correct way here. Have you ever wanted to know how to prepare matcha the proper Japanese way? Learn how to do this from umami-insider.com here.